The Harley-Davidson® Trike model lineup is designed for riders that want the ultimate in confidence and comfort for the longest rides. 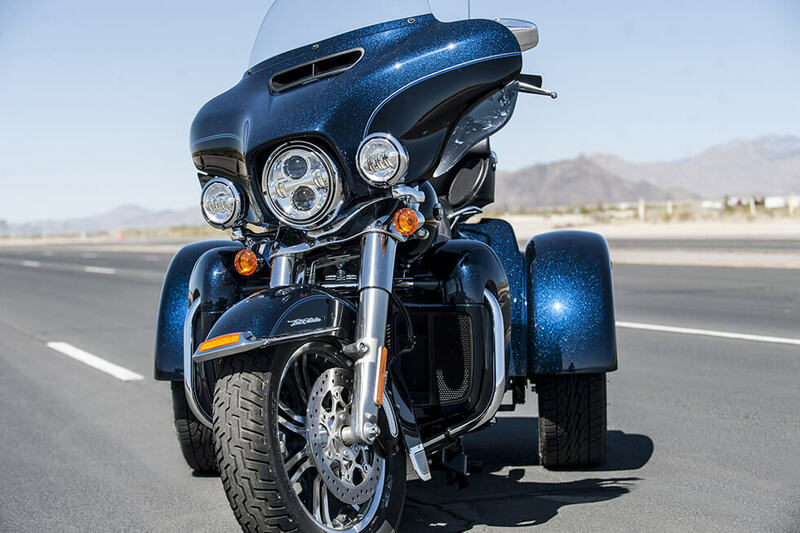 The Tri Glide® Ultra is about as much motorcycle as you can fit on three wheels – with smart touring features, authentic Harley-Davidson® styling, and a powerful V-twin, you can’t go wrong. 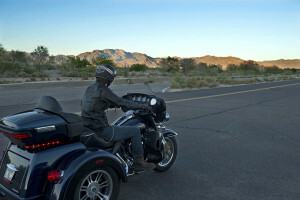 Find out more about the latest Tri-Glide® Ultra here at Riverside Harley-Davidson®. 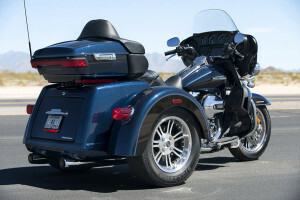 The Tri-Glide® Ultra offers three-wheeled confidence and control. 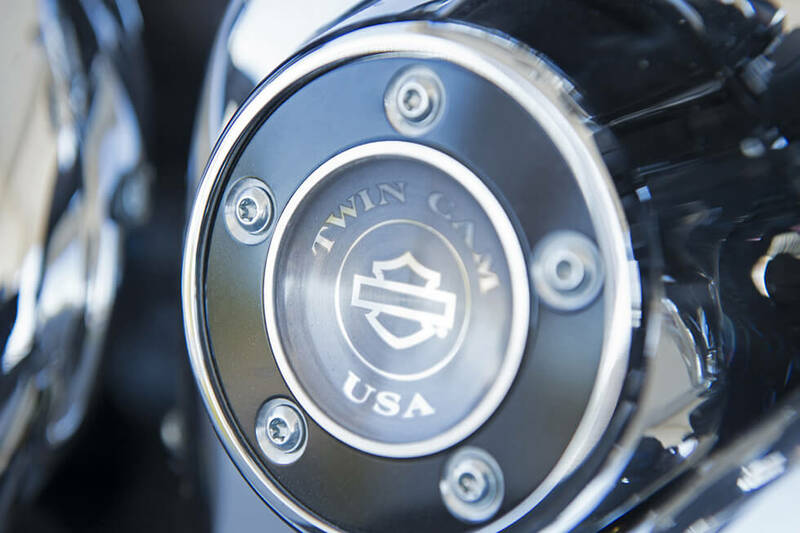 High Output Twin Cam 103™ Engine: The Tri Glide® is powered by this famous, High Output Twin Cam 103™ v-twin that delivers thrilling performance and time-tested durability. Daymaker™ LED Headlamp and LED Fog Lamp: 2,136 lumens punches through dark and fog, so you can see the road ahead with ease. High Output Twin Cam 103™ Engine Innovation: Rubber mounting lets this big v-twin run smoother, while electronic fuel injection and lightweight piston design deliver added performance. 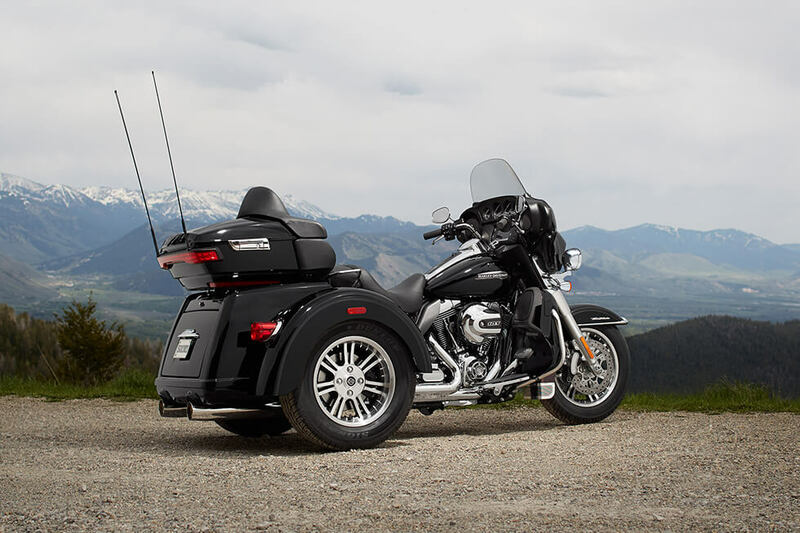 H-D® Smart Security System: While this system is optional, it is a great choice for riders who worry about their trike when they need to step away. This wireless security system automatically activates when you step away from the motorcycle. Dual Disc Front and Rear Brakes: With two brake rotors and calipers both front and rear you get all the stopping power you could ever want. 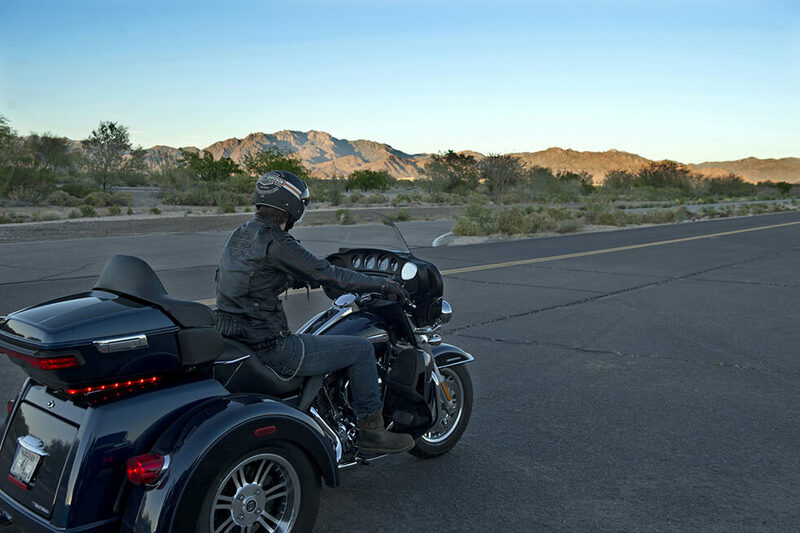 Linked Brakes: The brake system on the Tri Glide® is linked front to rear so when you activate the rear brake the front automatically engages. The front can be applied independently. Three Wheel Frame Design: The Tri Glide® offers the riding dynamics that you expect from a Harley-Davidson® and adds some comfort and confidence thanks to the third wheel. 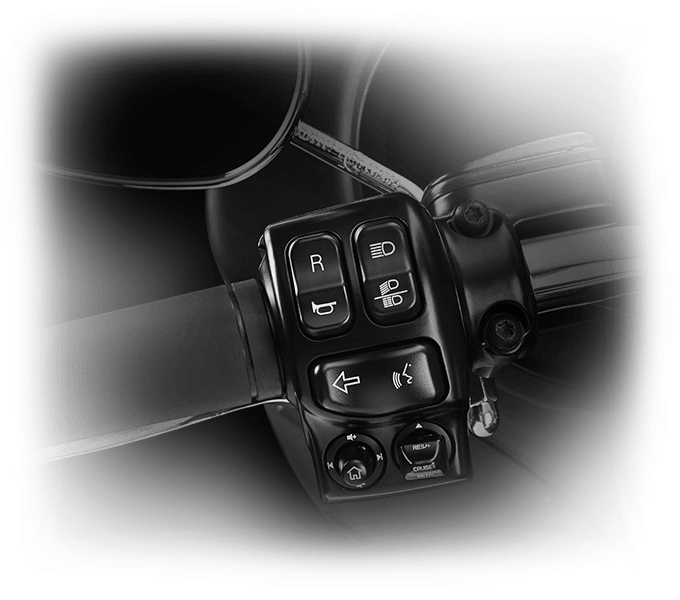 Ergonomically Designed Hand Controls: These controls give you access to all the buttons and switches you need; they’re perfectly situated to provide all day riding comfort. 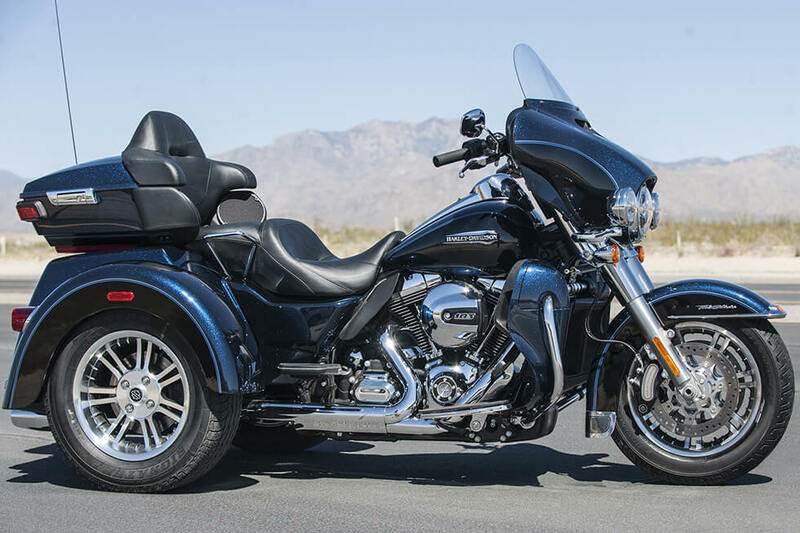 Steering Head and Forks: The forks on the new Tri Glide® are bigger than ever for more stiffness and more confidence when you hit the road. They also provide retuned damping for a smoother ride. Six-Speed Cruise Drive® Transmission: Smooth shifting is the name of the game with the Cruise Drive®. It lets you easily move through the gears to get up to speed. We know that you want to be connected when you hit the road. 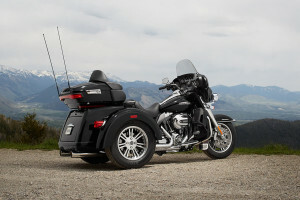 The Tri Glide® gets the latest infotainment system from Harley-Davidson® to do the job. 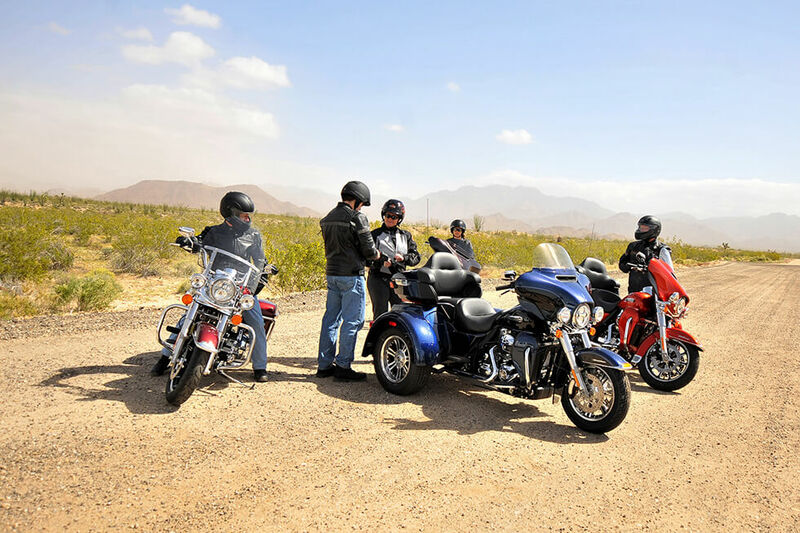 Project Rushmore Infotainment: With the latest infotainment system from Harley-Davidson® to give you features like navigation, smartphone connectivity, and more. 5.25-inch Front and Rear Speakers: With four speakers you’ve got plenty of volume, and excellent sound for both front and rear riders. Jukebox USB Port: It’s quick and easy to plug in your devices in order to stream audio, recharge, and even take advantage of voice commands and the built in hand controls on the bike. Voice Recognition and Bluetooth: With Bluetooth connectivity and voice recognition it’s easy to take advantage of your smartphone features even when you’re on the road. The Boom!™ Box 6.5GT Radio: With crystal clear sound, and more volume, this system delivers the audio experience you want. It even automatically adjusts for speed. 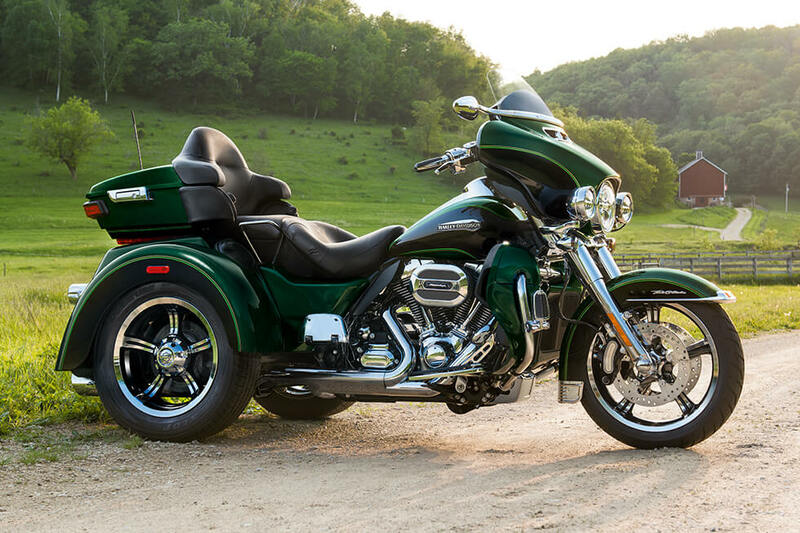 The Tri Glide® Ultra delivers that authentic Harley-Davidson® feeling. 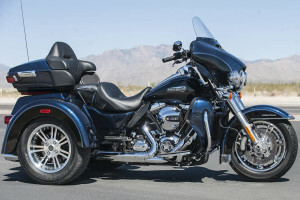 Wide Set Handlebar: You can sit up, spread your arms, and relax, because these wide set handlebars put you in the perfect position to ride for mile afer mile. Foot Operated Parking Brake: The parking brake is located conveniently by your left foot. One press engages it and another disengages the brake. Tour-Pak® Luggage Carrier: With space for two full face helmets, this convenient and smartly designed weatherproof luggage carrier is perfect for anything you need to take with you. 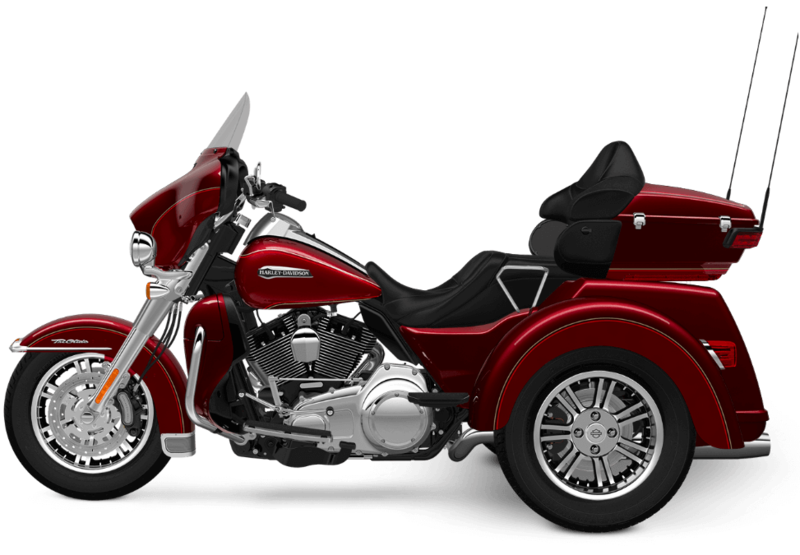 Electric Reverse With Handlebar Controls: Electric reverse will change your motorcycle experience. It’s easier than ever to get out of tight spots. Mid Frame Air Deflectors: Designed to deflect heat from the engine, this smart feature can help you stay more comfortable when you’re on the road on a hot day. 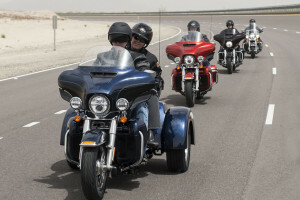 Accessory Connector: Hook up your hand warmers or seat warmers, or anything else you’ve got in mind, because the Tri Glide® can handle high voltage accessories without a problem. 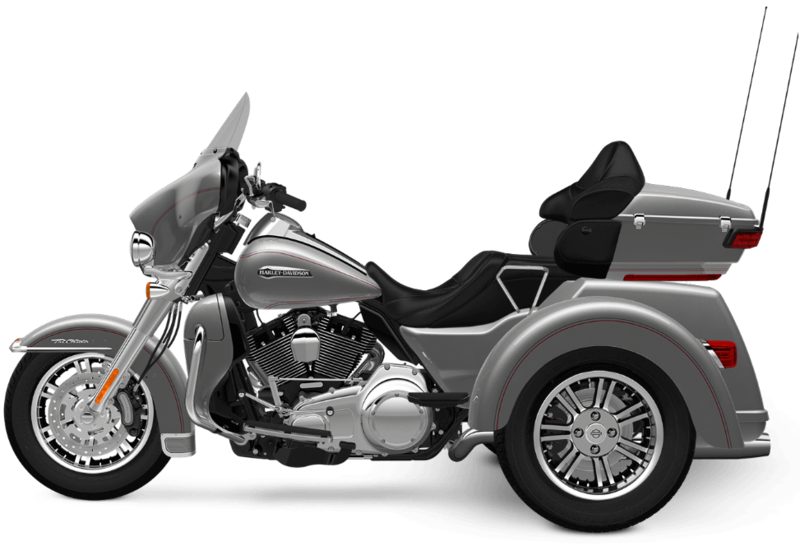 Trunk and King Tour-Pak® Storage: With a total cargo capacity of 6.7 cubic feet and up to 80 pounds, the Tri Glide® is capable of carrying any luggage you n need to take with you. Back and Arm Rests: The rear seat passenger will definitely appreciate the added comfort provided by back and arm rests in the second seat. 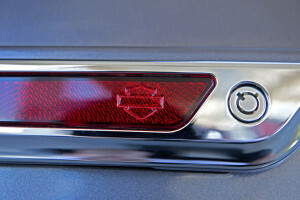 One Touch Fuel Door: You only need to press a single button and the fuel fill door pops open. 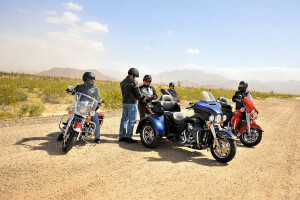 Cruise Control: You can definitely appreciate cruise control when you’re hitting the road and covering a lot territory. This standard feature will help you get where you’re going with less fatigue. Full-Length Floor Boards: These full length footboards provide rubber isolation so you can ignore that road vibration, and put your boots where you want. 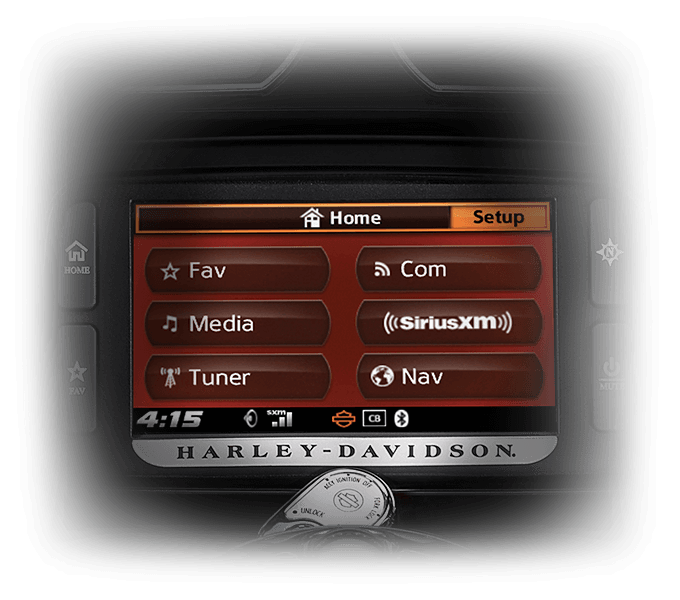 One Touch Design: Everything is designed to open with a single touch on Harley-Davidson® touring bikes. 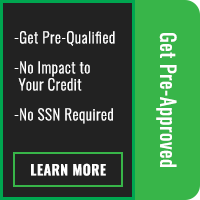 That makes everything easier and more convenient for you. 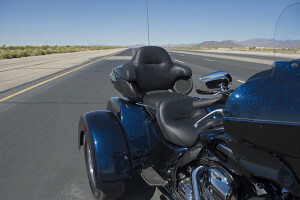 Fairing Design: The fairing of the Tri Glide® ultra was designed to cut down on head buffeting for long haul comfort and control. 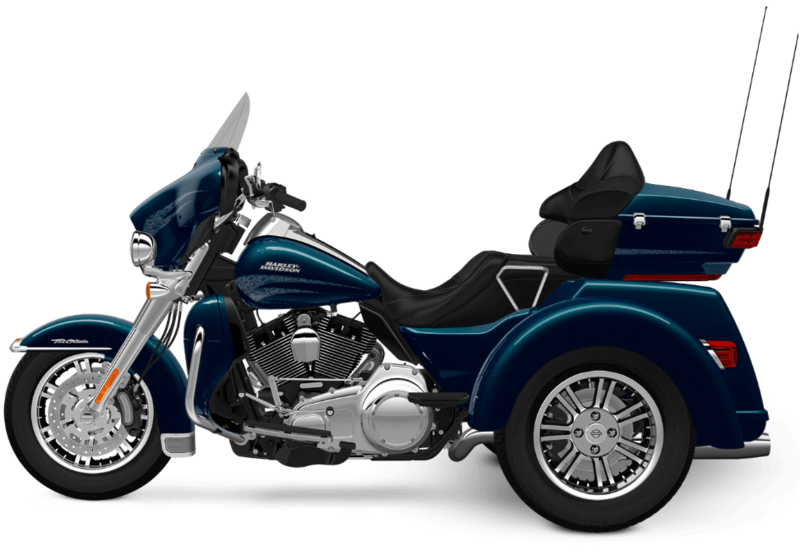 The Tri Glide® Ultra is an authentic, iconic Harley-Davidson® motorcycle with plenty of premium features. Seamless Styling and Matching Paint: You’ve got paint matched fenders, fuel tank, and trunk, for a straight from the factory seamless look that’s hard to ignore. 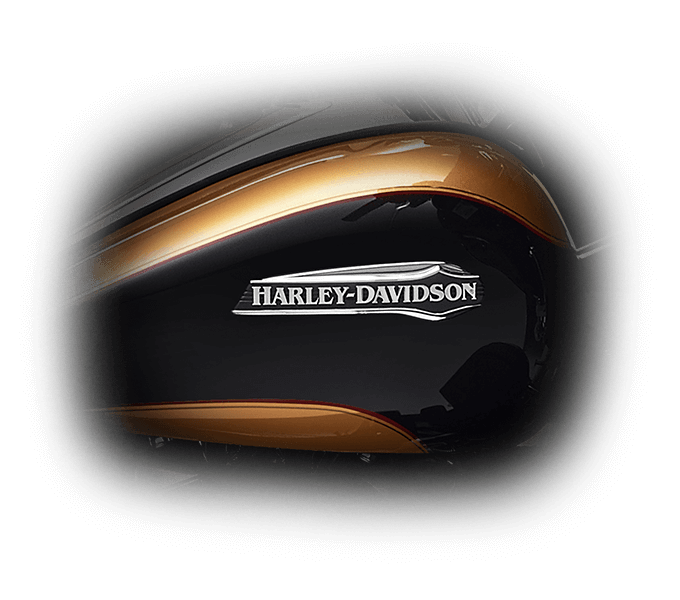 Tank and Fender Badges: These premium metal badges provide style and that custom touch that sets Harley-Davidson® motorcycles apart. 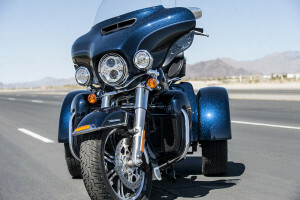 Pure Harley-Davidson® Styling: The Twin-Cooled High Output Twin Cam 103™ delivers good looks thanks to gleaming chrome rocker covers and air filter cover. 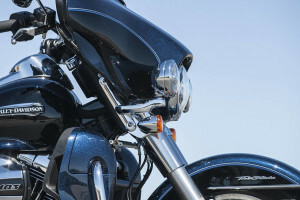 Inner Fairing Design: On the inside of the aerodynamic fairing you’ve got all the gauges and infotainment features framed by gloss black finishes, so you can see everything with ease. 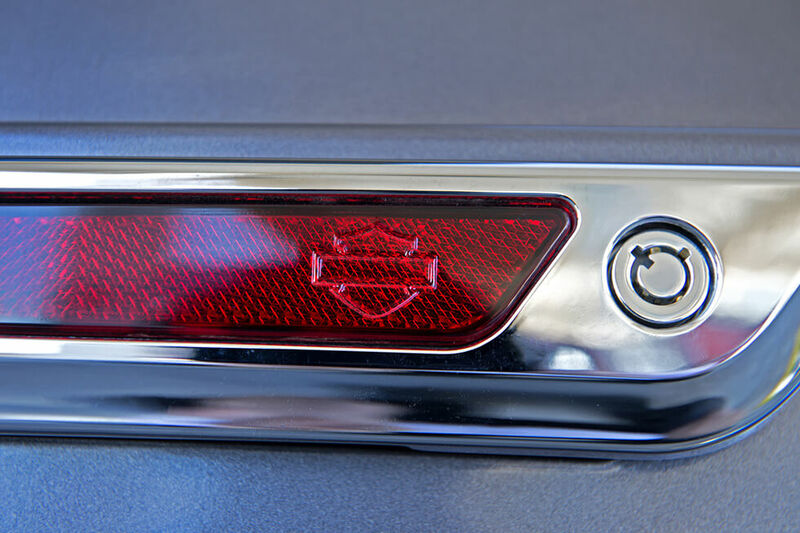 Bullet Turn Signals: These classic signals deliver the kind of good looks you want with the modern technology that provides exceptional visibility. Black 7-Spoke Aluminum Wheels: The seven spoke alloy wheels provide distinctive style, and a strong and lightweight platform for your rides. 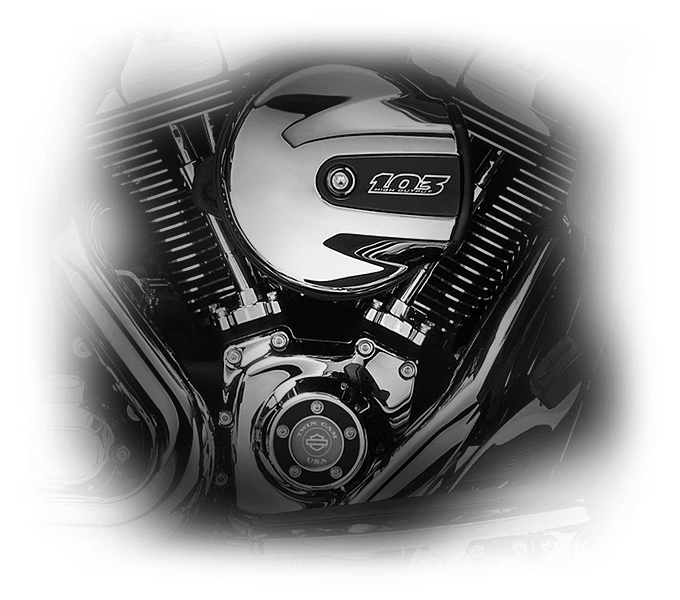 High Flow Airbox: The high flow airbox does a fantastic job of sending air to the v-twin, but it also looks good doing it with bold chrome finish, and custom badging.